BRADES – The Honourable Premier Donaldson Romeo said Friday evening that despite the recent resignation of Dr Ingrid Buffonge from his party, the People’s Democratic Movement (PDM) remains united. Earlier on Friday, Honourable Parliamentary Member Dr Ingrid Buffonge called the premier to state she lacked confidence in his ability to lead the government and tendered her resignation. 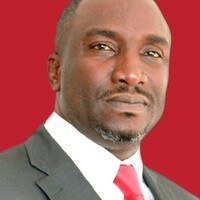 Buffonge had garnered the second largest number of votes behind Romeo in the September 11, 2014 elections in which the PDM one seven seats. Also in the statement, which he read on the national radio station, ZJB Radio Montserrat, the premier said despite news to the contrary, the Honourable Parliamentary Secretary Gregory Willock is still a member of his government and party. “Good day fellow citizens, residents and friends of Montserrat. “I understand that news has unfolded regarding a call to me this afternoon, from the Honourable Dr. Ingrid Buffonge, who indicated to me that she no longer wishes to be a part of the People’s Democratic Movement. “Although this is quite unfortunate, the PDM team wishes her well in her future endeavours, but the PDM party remains united. “The business of ‘Putting People First’ continues despite the fact that there are many challenges ahead. We can assure you, the people of Montserrat that PDM remains united in carrying out the mandate of running this Island and we will not let anything get in the way of delivering to you what you have elected us to do. “This week, we revealed to you the people, a renewed commitment of the partnership between Her Majesty’s Government and the Government of Montserrat and this is not only symbolic but a clear indication, of the British Government’s commitment to supporting the PDM Administration, in carrying out its mandate. As unfortunate as this resignation notice is, we will not be distracted from the important bread and butter matters of this Island and the important and ambitious development program ahead of us. “Please also do not think that there is anything wrong with the Honorable Gregory Willock proposing to step back from the Parliamentary Secretary post and remain a part of the PDM team. “We continue to be thankful for your support and prayers over the past year and solicit your patience as we continue to lead this country forward.